Pro-Sense Plus Dental Solutions Wipes provide antiseptic oral care and help freshen breath when used regularly. These peppermint flavor wipes help reduce plaque and tartar buildup, when used as directed and are suitable for dogs of all sizes. Pro-Sense brand offers a variety of proactive, sensible solutions for all of your pet's healthcare and wellness needs. We know pet parenting can be tough, which is why we've improved our ingredients and benefits to make it easier than ever to care for them like any other member of your family. Even your pup can experience dry skin in certain areas, so it's important to find a solution that will help them get back on track. Pro-Sense Plus Paw and Nose Solutions is formulated with Beeswax and Coconut Oil to help reduce symptoms from dry paws and noses. 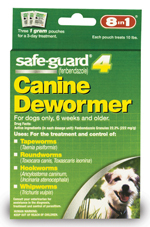 This formula is suitable for all dogs and daily use when used as directed. For a proactive approach to your dog's overall wellness, add a Pro-Sense Skin & Coat Solution to your daily routine. For external use on dogs only. Contains 3.25 ounces. Apply directly to soothe dry skin. Massage into your dog's nose and paw pads daily or as needed.